By May 1, 2002 every commercial TV station should have been transmitting its signals digitally. The average American family was supposed to be getting their favorite TV shows and sport programs in crystal-clear, high definition pictures, accompanied by movie theater quality sound. So far the High Definition TV revolution is equivalent to Ford's introduction of the Edsel in the '50s - it's a flop. Between existing satellite/cable based digital televisions and sizeable collections of "low" definition DVD players, consumers have a slow migration path from the analog signals of the 1950's to the high definition signals of the mid 21st century. Less than 30% of the commercial stations offer a digital version of their broadcast signals, and a pathetically limited number of programs are produced in the highest-quality HDTV format. It's no wonder that of the 22 million TV sets sold last year only 200,000 sets were equipped with digital over-the-air tuners. That is less than 1% of the sets sold last year! The FCC is reluctant to issue tough mandates to solve the problem. Hollywood does not produce the expected number of programs with digital content. Broadcasters are content to transmit high definition test patterns. CATV systems do not carry their digital offerings, representing a big chunk of the TV audience. Finally with no content to watch, consumers are not willing to buy expensive early generation sets. And until the quantities of sets sold increases, Hollywood and broadcasters will not improve the content - a vicious circle. Quoting FCC Chairman Michael Powell: "You have to get on the train, or it will run over you". Got the message? Like it or not, cable does not need any more PR black eyes. The CATV industry has to start digital TV carriage. Are you familiar with the operational or licensed HDTV stations available in your area? Management doctrine suggests that a new technology should be approached with data in hand. People in the trenches, do you have the proper DTV information in your files? Are you aware that DTV can also create severe interference problems, affecting the picture quality of your currently carried analog stations? Closing the DTV information gap, Biro Engineering can assist you with 55 mile radius printout of all analog and digital TV stations, listing computer calculated distances and Azimuth angles, as well as major technical parameters. The search can be limited to DTV stations only, eliminating the possibility that any of the operational digital stations will be missed, or to consider stations which are licensed, but not operational yet. 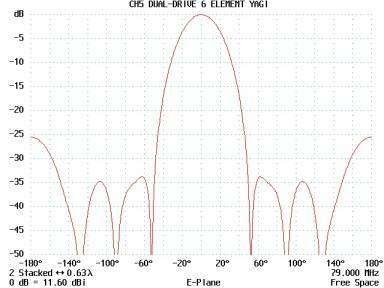 The above sample, developed for a small CATV system in rural Florida shows no operational DTV stations nearby. On the other hand there are many possible applications in the distant future, which should not be overlooked. Another important objective of a DTV information package is interference protection. 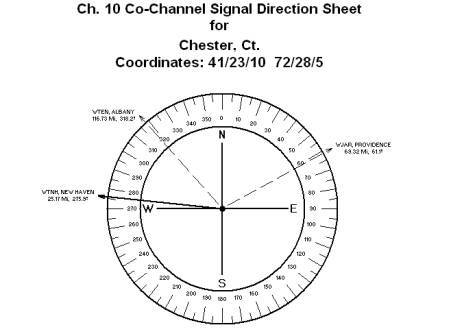 In case of Chester, Ct., the desired analog station, Channel 10, Providence, suffered periodic co-channel interference from the not too distant Channel 10 Digital station in New Haven, Ct. The Providence picture became noisy. The application of a co-channel filter was ineffective. The second choice, a properly designed phased-array, forcing a deep radiation pattern null into the New Haven direction was much more productive. 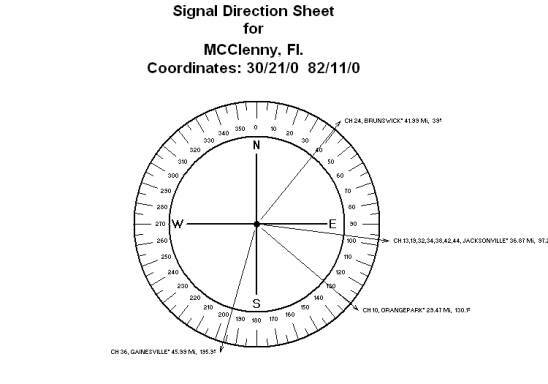 The co-channel signal direction sheet shows the essential details. 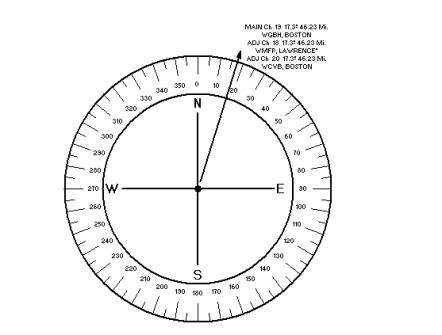 The DTV Signal Direction Sheet below displays interference conditions for the reception of Channel 5, WTIC, Hartford, a low power DTV station, received from a distance of 17 miles. Channel 5 DTV reception suffers from double co-channel interference. The Channel 5, Boston and Channel 5, New York, analog stations are almost equidistant form Middletown, arriving exactly from the opposite directions. A phased-array of two, horizontally stacked high-gain Yagis, with a horizontal spacing of H = 96 1/4", will ascertain highly effective interference rejection of both co-channel sources. The rectangular radiation pattern below demonstrates the protection capabilities of the selected phased-array. At location "Z" in the greater Boston Metropolitan area, the system wanted to carry Channel 19, the Digital TV station of Channel 2, Boston. The Adjacent Channel Signal Direction Sheet, developed for the site, demonstrated that Channel 19 is squeezed-in between Channel 18 and Channel 20. All three are Boston DTV stations, but currently only Channel 19 and Channel 20 in operation. Since all three transmit antennas are co-located, the signals arrive from the same direction. Consequently, a phased-array cannot protect the Channel 19 reception from the adjacent channel interference created by Channel 18 and Channel 20. This unfortunate situation was created by the FCC frequency assignment. The cure rests with a technical review by the Agency. A few weeks ago the National Cable TV Association (NCTA) pledged its full cooperation to speed up the introduction of High Definition TV. A nice political gesture toward Capitol Hill and the FCC, which should be followed through in the technical arena. List of the area's DTV stations on-the-air (to be updated periodically). Reception information (directions and distances). Technical parameters of the stations (output power, transmit antenna height, polarization). Noisy background, color distortions in the pictures? (Co-channel and adjacent channel interference sources). Elimination of the interference. (Design and application of the proper antenna-arrays). The above listed information and specialized technical assistance is available. Your inquiries are welcome.